From about 1910 the Class "K" horizontal engine replaced Paxman's older girder types. The first part of this page gives details of the Class "K", as described in Paxman catalogue 544, entitled Horizontal Steam Engines, Class "K" , printed in April 1910. A fuller description of the Class "K" appears in catalogue 741, Power Plant for Laundries , dated 1926. By this time the engine could operate at steam pressures up to 120 psi. Those versions built for 100 and 120 psi working pressure had a separate cylinder liner of "specially hard metal" forced in, but for lower pressures no liner was supplied. Also by 1926 Paxman was offering an Oil Free type of the Class K which was of particular relevance to laundry operations. Reproduced lower down this page is that part of the Power Plant for Laundries catalogue which has a description and specifications of the Class K as at 1926. These engines have been specially designed to meet the demand for an inexpensive, yet reliable, steam engine, capable of developing a large amount of power in proportion to the space occupied, suitable for steam pressures up to 100 lb. per square inch, easy of transport, and requiring a minimum of foundation. They are especially suitable for steam laundries, dairies, and small factories, requiring a simple and reliable engine ; and on account of the small amount of fixing necessary and the facility for transport they are well adapted to export. A force pump, worked by an eccentric from the crankshaft can be supplied at an extra charge, if required. A variable expansion eccentric and reversing apparatus is fitted to our class "K" engines without extra charge. The slide valve eccentric is adjustable, and by this means the cut-off may be varied between one-quarter and five-eighths of the stroke, in proportion to the power required to be given off by the engine, thus effecting a notable economy in the quantity of steam used, and consequently in fuel. The eccentric sheave is so arranged as to form a simple reversing apparatus, so that the engine may run in either direction, as the exigencies of the duty may require. The Governor is of the well-known and efficient Pickering type, acting directly upon an equilibrium throttle valve in the steam chest. It is fitted with a patent ball speed ranger, which secures a wide range of speed, and gives equally close regulation at either the extreme or intermediate speeds. This patent speed ranger enables the speed of the engine to be varies approximately 50% from the minimum, without necessitating any change in the size of the governor pulley, the arrangement being simplicity itself. At an extra charge, the governor can be fitted with an automatic stop motion, which is designed to prevent the engine running away should the governor belt break or run off the pulleys. For extra price see price list. If necessary, the engine can be mounted on a deep cast-iron base, of suitable height to enable the flywheel to clear the floor, as shown in our illustration. For extra price of this, see price list. We give below a table showing the sizes of our class "K" engines for industrial purposes generally. In comparing these engines with those of other makers, it should be borne in mind that they have been specially designed to work at a higher boiler pressure and piston speed ; consequently they will give off more power than engines having identical cylinder dimensions, but which are not designed for such a high speed or pressure as our own. When these class "K" engines are required for driving electrical or other quick-running machinery, the speeds can be increased in accordance with the table given below. It will be seen that in consequence of the higher speed the engines develop a higher b.h.p. Price List - Paxman Self-Contained Horizontal Engines, Class "K"
6½" £46 10s. £4 £2 £8 £0 12s. 7½" £55 0s. £4 £2 £8 £0 12s. 8" £65 0s. £5 £2 10s. £13 5s. £0 15s. 9" £75 0s. £5 £2 10s. £13 5s. £0 15s. 10" £100 0s. £6 10s. £3 £18 10s. £1 0s. 11" £112 0s. £6 10s. £3 £18 10s. £1 0s. 12" £138 0s. £8 10s. £4 £23 £1 2s. 13" £152 0s. £8 10s. £4 £23 £1 2s. These Class "K" engines embody the same careful and accurate workmanship, the same high-class material, the same minute attention to all the points in design making for efficiency, as our largest engines for electrical stations. Bed. The Bed is of massive box section, ensuring strength and rigidity in working, the shape in plan being somewhat similar to a banjo. The trunk end is accurately bored to form a sliding surface for the crosshead, the opposite end of the bed being arranged to receive the crankshaft bearings, which are adjustable. Cylinder. The Cylinder is of the best close-grained cast-iron, air jacketed. For engines built for 100 lbs. and 120 lbs. pressure a separate liner of specially hard metal is forced in, but for lower pressure engines no liner is supplied. The cylinder is lagged with non-conducting composition, and covered with a sheet of planished steel. Piston and Rods. The Piston is of cast-iron, fitted with three Ramsbottom rings, the Piston Rod and Valve Rods being of mild steel. Crankshaft. The Crankshaft is of mild steel, bent from a solid bar without welding, turned for crankpin and bearings, and polished bright. It is of sufficient length to receive a pulley on the opposite end to the flywheel. A Variable Expansion Eccentric. A Variable Expansion Eccentric and reversing apparatus is fitted to our class "K" engines without extra charge. 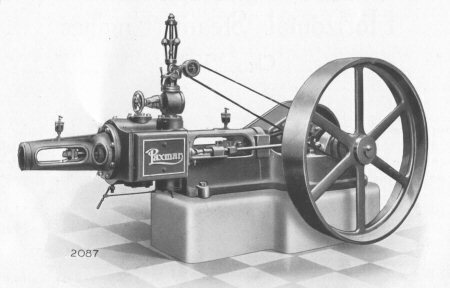 The slide valve eccentric is adjustable, and by this means the cut-off is varied from zero to five-eighths of the stroke, in proportion to the power required to be given off by the engine, thus effecting a notable economy in the quantity of steam used, and consequently in fuel. The eccentric sheave is also arranged to form a simple reversing apparatus, so that the engine can be made to run in either direction as may be required. Lubrication. A very efficient system of lubrication is provided for all working parts, comprising suitable mechanical lubricator to steam inlet, centrifugal oiler to crankpin, chain lubrication to bearings and sight feed lubricators to remaining parts, all of which can be re-charged while the engine is running. This system of lubrication enables the engine to work continuously with the minimum of attention. Governor. The Governor is of the well-known and efficient Pickering type, acting directly upon an equilibrium throttle valve in its steam chest. It is fitted with means for slightly varying the speed of engine while running. At an extra charge, the governor can be fitted with an automatic stop motion, which is designed to prevent the engine running away should the governor belt break or run off the pulleys. Slide Valve. This is of the double port, balanced type. Friction, therefore, is reduced to a minimum between the port faces and slide valve, which reduces wear and throws a much lighter stress on the valve gear. This, in conjunction with the efficient lubricating arrangement provided, considerable lengthens the life of the engine. Splash Guard & Oil Tray. A planished steel splash guard in conjunction with an oil tray (which latter is cast in the bed) are also supplied to prevent any possibility of the oil reaching the foundations. 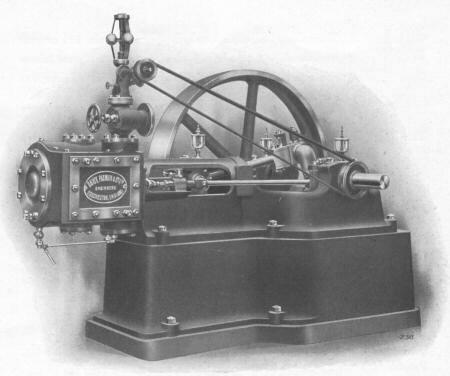 The standard engines described in the foregoing pages are suitable for saturated steam, but at a slight extra cost they can be fitted with special packing to the piston rod and slide valve rod, also a special valve for the governor, which makes them in every way suitable for steam superheated up to 100 degrees Fahr. All these engines are suitable for working against back pressure. The steam consumption will be increased under these conditions according to the degree of pressure in the exhaust mains. SERIES "A." Fitted with cylinder liner and air jacket. For steam pressure of 120 lbs. per sq. in. SERIES "B." Fitted with cylinder liner and air jacket. For steam pressure of 100 lbs. per sq. in. SERIES "C." No cylinder liner or air jacket fitted. For steam pressure of 80 lbs. per sq. in. SERIES "D." No cylinder liner or air jacket fitted. For steam pressure of 60 lbs. per sq. in.